Topher had a lot of heart. 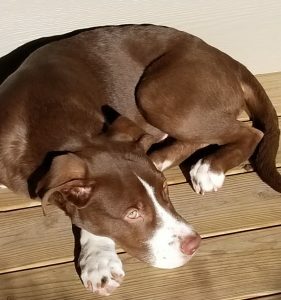 The 3-month-old Labrador-pit bull puppy had been consigned to oblivion, abandoned in a dumpster in southwest Missouri. He managed to stay alive long enough to come under the protection of Rescue One, a state-licensed, foster-based animal rescue in Springfield, Missouri. 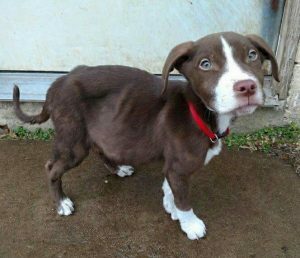 Topher was a 3-month-old mixed breed puppy, when he was rescued from a dumpster in southwest Missouri. But, there was a problem. His belly would rapidly fill with fluid. Rescue One staff took Topher to Seven Hills Veterinary Clinic in nearby Nixa, Missouri. 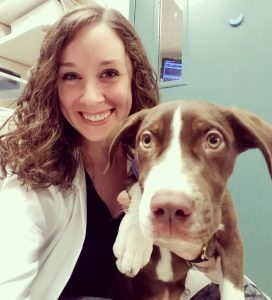 Ana Smith, a veterinarian at Seven Hills, examined Topher and although there was no abnormality she could detect with a stethoscope, she recommended that he be taken to the MU Veterinary Health Center (VHC) to see the Cardiology Service for further care. Indeed, Topher had too much heart. He had a congenital heart defect called cor triatriatum dexter. The normal heart has four chambers: two top chambers, known as the atria, and two bottom chambers, the ventricles. Topher had a triatrial heart. At his one-month recheck, Topher reunites with Kelly Wiggen, DVM, one of the cardiology team members who repaired his heart. “Cor triatriatum dexter is basically a fancy term for the fact that Topher had three top chambers to his heart,” Wiggen says. “The upper chamber on the right side was split in two, with a front half and a back half divided by a membrane. “What happens in this disease is blood from the top half of the body can drain normally into the front chamber of the right side, which allows it to go out to the lungs, and then get pumped out to the rest of the body to deliver oxygen,” Wiggen says. “But, all the blood from the back half of the body is getting dumped into the back chamber, and the problem with that is that sometimes there’s either no opening in that back chamber or there’s only a tiny opening. The VHC cardiology team consisting of Wiggen, resident Lyndsay Kong, DVM, and head of cardiology Stacey Leach, DVM, were able to get a successful diagnosis using an echocardiogram. “We talked to them about fixing this surgically, using minimally invasive techniques,” Wiggen said. “Essentially, we went in through a blood vessel in his back leg and up into that back chamber of his heart. We used two different types of balloons to blow open that tiny hole between the back chamber and the front chamber. First, we used a cutting balloon, which has four little razor blades on it. When you inflate it, the razor blades pop out and they cut into that tissue. Then, we removed the cutting balloon and inserted a high-pressure balloon, which is much bigger. Topher returned to the VHC in April for his one-month, post-operative checkup. A healthier, happier Topher relaxes on the deck, at home with his forever family. “When he came back for his recheck, he was doing fantastic and didn’t have any more fluid buildup in his belly,” Wiggen says. “He was gaining weight and looked like a normal puppy. He was so excited to be here, he was bouncing all over the place, jumping on people, wanting to lick everyone’s face, saying, ‘hi’ to everybody. It was so exciting to see him, he was just adorable,” Wiggen said. When Topher first came to the VHC, he belonged to Rescue One. The organization does not have a dedicated facility, but relies on a network of 140 dedicated foster care providers. Topher’s original foster, Dezirae Holmes of Ozark, Missouri, cared for the pup through his surgery. He gained a second foster family in late March. Rachel and Jamie Hankins of Republic, Missouri, finalized the adoption and became Topher’s forever family on April 20. The Hankins brought Topher to his April checkup, but it was not their first trip to the VHC. “About six years ago, our Jack Russell terrier, Henry, had a cancerous growth on his thyroid,” Rachel Hankins said. “We brought him up to Mizzou and Dr. Brian Flesner oversaw his treatment and Henry had a successful surgery to remove the tumor. Henry was 9 at the time, and he made it till he was 13. He passed away a couple years ago, but those four more years with him were precious to us. So, we’ve had fantastic experiences with both dogs at the VHC. We can’t thank them enough.